Most of you have never had a garment designed and made for you. Let me explain the process. Whether you work with me here in my design studio or long distance via email, you will be in the driver’s seat. From design details to scheduling your fittings and delivery. I will take the descriptions and photos of features you want for your design. It’s okay if you don’t have specific ideas. We will get to know each other and I will determine what you want even if you don’t have a clue what you want! I will sketch the design (as many as it takes) that will ultimately be created just for you. I will help you select the fabrics, lace or beading that will work best for your design. I will guide you on color choices and surface design features. Though it is best to meet in person, it can be managed via the internet. Once we have the sketch and fabric choices, your garment will be costed out and you will receive a written price quote. There are no added charges unless you change your mind about the design or change your body. These extra charges are rare and can be avoided with communication. A deposit of fifty percent is required before any work can begin or fabrics purchased. Once the deposit is made, the original sketch is yours, along with swatches. If you are not local, everything will be mailed to you. As I said, you are in the driver’s seat. I will schedule your fittings/delivery based on your timeline and wishes. 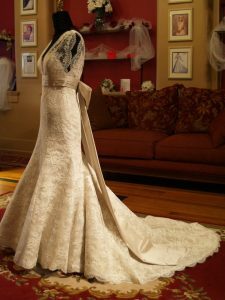 We have made custom wedding gowns with less than a week’s notice. 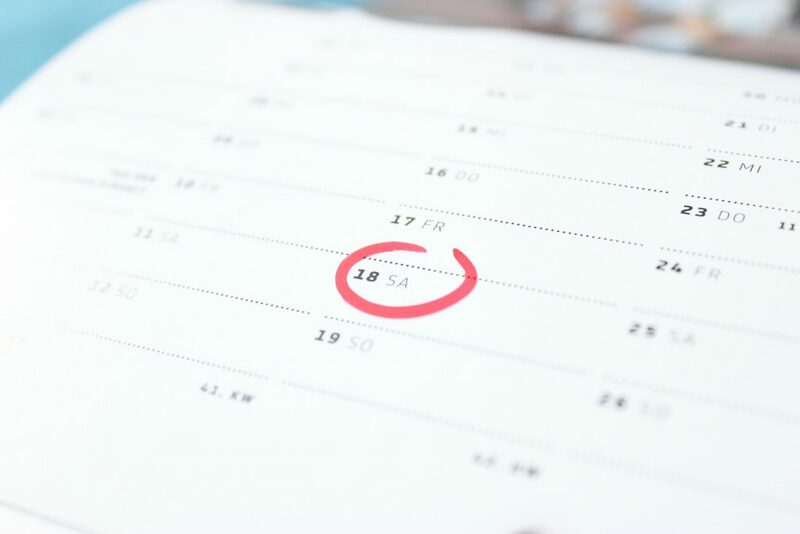 Though it can be done, we would prefer to have several months to create your design. 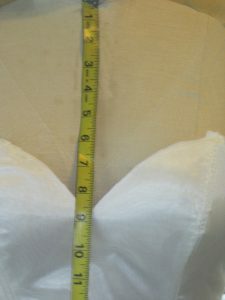 Before any patterns are made or fittings scheduled, I will need your measurements. If you come to my shop for your design session, I will take your measurements at that time (or wait until you are happy with your weight or new fitness level). If you are long distance client, I will send you a measurement sheet to have filled out by a qualified seamstress or tailor. (they sometimes charge for this) The garment will fit as well as the measurements I am given. The next fitting will be YOUR garment. In the right color and fabric! In some cases, there are surface design details. Again, we are making sure everything fits properly. For long distance customers, you can plan to visit my shop for this fitting, or plan to have it fitted by a qualified seamstress. (the seamstress will charge for this) We can arrange to SKYPE so I can put my two cents in on the fitting. The next fitting is generally the FINAL fitting. Your garment is finished sans pressing. We will do any required tweaking. Sometimes we can do this while you wait, or will schedule a Pick-Up appointment. For long distance customers, you can plan to visit my shop for this fitting, or have it shipped to you to have it fitted by a qualified seamstress. (the seamstress will charge for this) If there are major fit issues (hasn’t happened yet) mail it back and we will do the work. If there are issues I will require either a SKYPE session or a video and photos taken of the fitting. The pick-up fitting is kind of obvious, eh? You may try it on again, but it isn’t necessary. You can send someone else to pick it up if you want, and it will be pressed, ready for you to wear. For long distance customers, your garment will be mailed to you and it will probably need to be pressed by a professional.